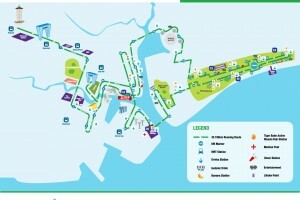 Routes and enhancements for Standard Chartered Marathon Singapore 2015 | JustRunLah! 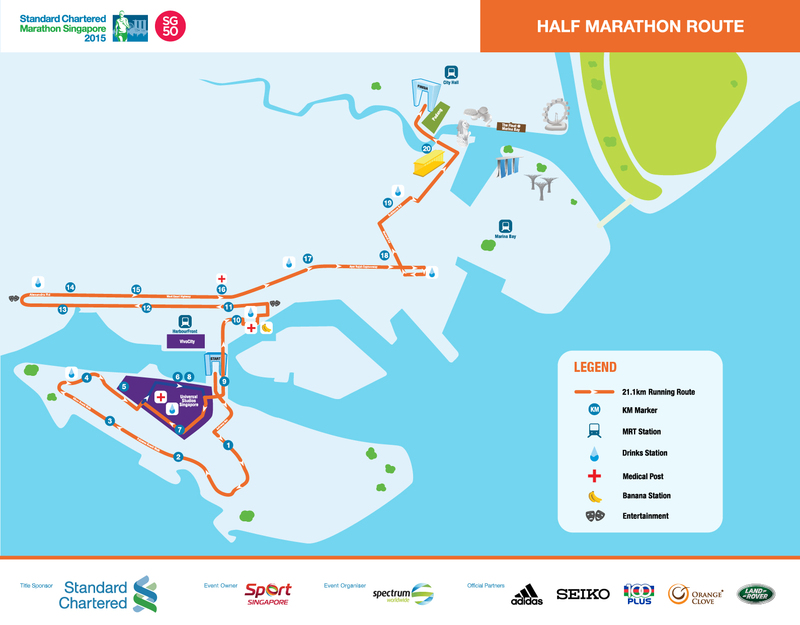 1 October 2015, Singapore – The Standard Chartered Marathon Singapore 2015 (SCMS) today announced the race route and improvements to offer both participants and supporters an enhanced experience at the country’s biggest marathon, which will be held over two days for the first time in the event’s history, on 5th & 6th December. Runners participating in the full marathon will be better looked after than ever been before due to the substantial participant support enhancements such as improved route management and the availability of 16 hydration stations, strategically placed to offer runners replenishment on average every 2.6 kilometres. In addition, the half-marathon will for the first time have a banana station, all aimed at helping more runners get to the finish line. On-route entertainment has also been given a boost this year at locations such as East Coast Park and West Coast Highway, to keep runners inspired and motivated. Runners can expect to see cheerleaders, live bands or LED robots among additions, creating a vibrant and energetic atmosphere to spur on the runners, as the ply their way through the halfway point and into the home leg of the race. The route for the 2015 Marathon will remain largely unchanged, meandering through the country’s most iconic landmarks, beginning outside of Mandarin Gallery (Orchard Road), proceeding along shopping district Orchard Road before turning at Singapore Management University (SMU) and then to two of Singapore’s most popular tourist spots Clarke Quay and Chinatown before moving onto Nicoll Highway and towards the Sports Hub. 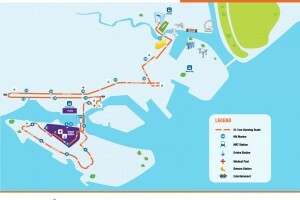 The middle third of the race will see runners cover the length of East Coast Park, before reaching the Marina Bay district where participants will get to run by the world-renowned Garden’s By the Bay and Marina Bay Sands, and finally returning to the central business district for their finish at the Padang. Participants of the half marathon will begin at Sentosa Gateway, running through Sentosa Island, and Universal Studios Singapore where they will be greeted by characters from their favourite movies. Upon leaving the island, they will make their way into the central business district, and pass Marina Bay before ending at the Padang. 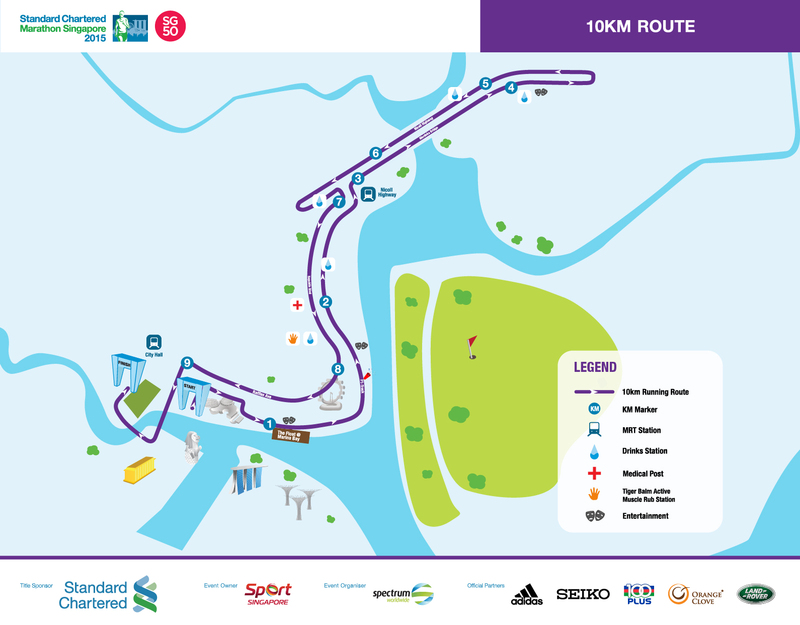 The 10km runners will start their race at Esplanade Drive, passing by the flyer as they run on what was just weeks ago a Formula 1 track. They will then make their way onto the historic Merdeka Bridge before turning onto Nicoll Highway, Republic Boulevard and Raffles Avenue. The Kids Dash, which will become a standalone event this year, takes place on Saturday 5th December. After the 700m race, the youngsters and their parents will be able to enjoy themselves at the 8th ASEAN Para Games carnival or cheer on our para-athletes at the various competition venues at the Sports Hub. All these happen right besides the 100PLUS Sports Promenade where the Kids Dash takes place. 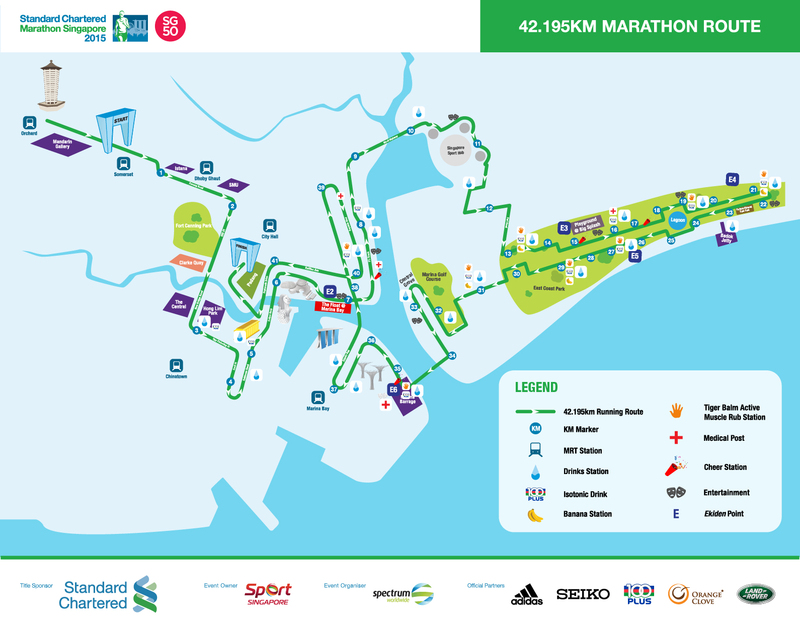 In its 14th year, Standard Chartered Marathon Singapore 2015 will take place on 5 and 6 December. Run Magazine (Official Running Magazine); GIVEasia (Official Charity Fundraising Platform); RWS (Official Venue); Sentosa (Official Venue); Johnson & Johnson (Official Supporter); CYC Movers (Official Logistics Partner); Neutrogena (Official Sunscreen) and Acuvue (official Eye Care). 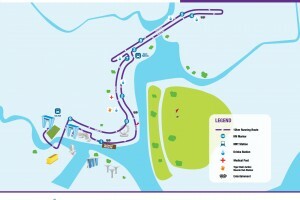 For more information and details on Standard Chartered Marathon Singapore 2015, see www.marathonsingapore.com.